On May 12, eighty 7th graders from Timberstone Junior High School spent their school day outside at The Olander Park System’s Sylvan Prairie Park. 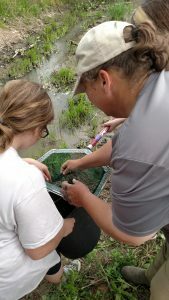 The students planted 300 native trees and shrubs, and 1,000 native grasses and wildflowers, and participated in an educational water quality activity led by Partners for Clean Streams’ Mike Mathis. This is the 5th year Timberstone Junior High’s 7th Grade Reading class has partnered with The Olander Park System for this day of community service. Teachers Melissa Dubiel and Tammy Gordon organize the 7th Grade class’s annual community service program called “Packed with Pride.” Each year, the 7th Grade Reading students organize, publicize and complete drives for local organizations. This year they collected items for Paws and Whiskers, Hannah’s Socks, Fellowship Matters and Austin’s Book Club. 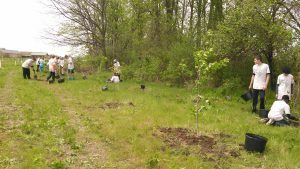 The field trip to help The Olander Park System plant trees is a culminating activity for a year of helping the community. The school funds the field trip through a grant from Target. This year at the field day, teachers Joe Wendt, Ellen Bellemore and Melissa Dubiel supervised groups of students who worked with staff from The Olander Park System to plant native trees and grasses and wildflowers at Sylvan Prairie Park. The planting is part of a floodplain restoration project financed through a grant from the Ohio Environmental Protection Agency and the United States Environmental Protection Agency, under the provisions of Section 319(h) of the Clean Water Act. Olander Parks designed the project to create new wildlife habitat in the floodplain and improve water quality in the streams of Sylvan Prairie Park. 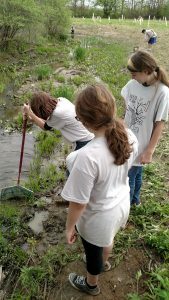 The 7th graders learned about these water quality benefits and about the critters that need clean streams to survive during a fun hands-on stream activity put on by Mike Mathis from Partners for Clean Streams. The 7th graders were excited to see wildlife using the land they were helping to restore. They saw Leopard Frogs, American Toads, Deer Mice (babies! ), Crayfish, Snapping Turtle (baby! ), Killdeer (eggs! ), Red-tailed Hawk, and even a Long-bodied Cellar Spider eating ants. TOPS was excited to partner with the school and Partners for Clean Streams to make the “Packed with Pride” field trip a meaningful learning experience for the 7th Graders of Timberstone and to promote a connection with nature in this young generation.